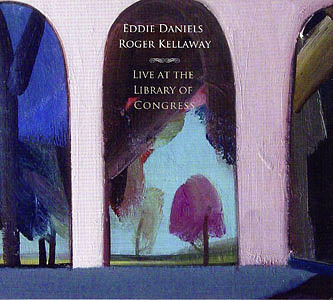 Live at the Library of Congress, Eddie Daniels, clarinet and Roger Kellaway, piano. This is a wonderfully sympathetic duo. Pianist Roger Kellaway has an identity which brings together Ellis Larkins, Bill Evans and deep knowledge of jazz piano, whilst Eddie Daniels may be the most formidably correct clarinetist in jazz today, without ever letting technique get in the way of expression. Add to this duo's many attributes the fact that they play without a safety net and you have something special—so much so that Kellaway and Daniels even make something out of the old George Gershwinwarhorse "Strike up the Band," which combines impressionistic qualities with sly, insidious wit. Of the two, it's Kellaway to whom this quality comes most readily, although the duo's level of mutual knowledge ensures that when Daniels drops into proceedings, the pianist makes a point of completing the clarinetist's phrase. Stephen Sondheim's 'Somewhere' is a song that's easy to get wrong, but these guys don't. Their reading combines faintly rhapsodic qualities with uncommon poignancy. It's also one of those occasions when Kellaway proves himself an undervalued solo pianist, before Daniels comes back in to take it home with his exquisite tone. Given the bulk of the program, Thelonious Monk's "Rhythm-a-ning" sticks out a little—or it would, if the artistry on offer wasn't equal to virtually anything . In his solo work, Daniels brings a radically different personality to that of Steve Lacy's soprano saxophone, demonstrating that the secret to reading Monk lies in striking a balance between the composer's vision and a musician's own individuality. Kellaway's "A Place that You Want to Call Home" is poignancy writ large, and thus tailor-made for Daniels's pure tone. It closes out a program in which a range of material is encompassed by a duo for whom empathy is second nature and understanding comes naturally. Track Listing: Strike Up the Band; Capriccio Twilight; Somewhere; Rhythm-a-ning; America The Beautiful; Etude of a Woman / Pretty Women; Just Friends; A Place that You want to Call Home; 50 State Rambler. I think the expression is "cut from the same cloth." Had Daniels and Kellaway never played together, it would be one of those 'it's only a matter of time" things. The two are among the most adventurous musicians I've ever encountered, and, as they have on several previous recordings, they're a riveting duo again here. Both musicians are absolutely fearless. They'll rain cascades of notes upon your head at the blur of a feather. And they do it with such heavy-duty musicianship that it can only make you shake your head in wonder. Each contributes an original or two in this startling performance, and the rest of it ends up as varied as "Strike Up The Band," on one hand, and "Rhythm-A-Ning" on the other. You'll also hear familiar fare such as Leonard Bernstein's West Side Story gem, "Somewhere"; a go-for-broke version of the aged-in-marble standard, "Just Friends"; and a medley of three tunes starting with the prettiest patriotic song of them all, "America The Beautiful." This incredible journey comes to a close with a Kellaway creation called "50 State Rambler." It's textbook rapid-fire communication between two guys who are not supposed to be able to do this stuff. But take a deep breath and enjoy it. Because they do! Both of these highly-respected performers are equally at home in the classical or jazz genres and most anything else. Together and separately they already account for a half dozen releases on the IPO label. And this is actually a sequel to their earlier IPO duo album, A Duet of One. This is not one of those historical concerts from the Library of Congress issued by Bridge, but a new recording made February 25, 2010 in the Library’s Coolidge Auditorium. Eddie Daniels is a Renaissance virtuoso who has helped to bring down the walls between classical and jazz. One is reminded of Benny Goodman’s straddling of the jazz and classical worlds. Daniels was known for his work with the Thad Jones-Mel Lewis Band, and has won numerous Grammy awards and nominations. Roger Kellaway has composed for the New York City Ballet, LA Philharmonic and the National Symphony, and has been musical director for Bobby Darin, Barbra Streisand, Tony Bennett, Van Morrison, and at the Hollywood Bowl. He wrote a two-hour program on Kurt Weill for West German Radio, the score for the London production of Lenny, directed a tour of Kevin Spacey’s Beyond the Sea and dedicated his Heroes trio album to Oscar Peterson. My personal favorites are his two Cello Quartet albums. Since the ten tunes here are just for clarinet and piano, they quite naturally skirt the classical area as well as jazz in their delightful improvisations. With music from Gershwin, Bernstein, Sondheim and Monk they have a head start on musical success. There are also three originals from Kellaway himself and one from Daniels. Nearly all the tracks are over six minutes length and the opener—a rousing “Strike Up the Band” of Gershwin—is eight and half minutes. In the middle of the concert is a rather funky version of an unexpected choice: “America the Beautiful.” The duo provides some fresh and very enjoyable listening. TrackList: Strike Up the Band, Capriccio Twilight, Somewhere, Rhythm-a-ning, America the Beautiful, Etude of a Woman/Pretty Women, Just Friends, A Place that You Want to Call Home, 50-State Rambler.